A couple weeks ago, a car had run over my right foot. The doctors said that my right hallux was sprained and the X-Ray done soon after showed fracture on the head of 2nd, 3rd, 4th and 5th metatarsal bone and fracture in the small toe on the joint between metatarsal and proximal phalanx. The hospital had plastered my right leg (foot, ankle and a small part of the leg). For the first few days it was normal but then I started feeling a bit numb in my right foot hallux. I thought it was due to the Plaster-of-Paris they had put around my leg. From the last few days, it feels like the upper-left corner of my nail (in my right great toe) is digging into my skin AND when I touch under the interphalangeal joint of my right great toe, it feels like a jolt of electricity passing through my right great toe and through a certain area around it. The harder I press, the stronger the intensity of the jolt is. I think those jolts are affecting the rest of the foot including the fractured bones. What could be the reason for it and what should I do to stop it? P.S. 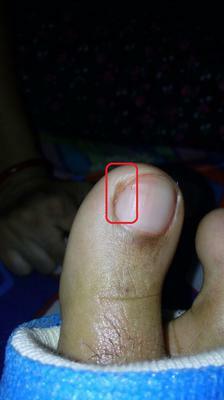 The reddish color on my right great toe nail is an ointment not blood but the yellowish color on the skin adjoining the upper-left corner of the nail is not and ointment. I clipped a portion of my nail to stop it from further digging into the skin but I don't know if there is any more nail that is still digging into the skin. 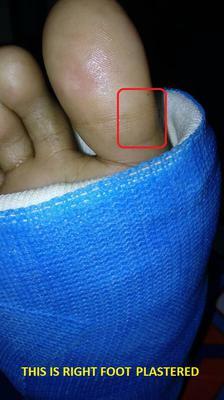 The fold (where the great toe bends) is the area which sends jolt of electricity on being touched or pressed. in the area of the uppermost part of the fibula bone, just below the knee joint. This could cause neurological symptoms like numbness in the foot. Having said that, your jolt of electricity at the plantar aspect of the interphalangeal joint of the big toe (as seen in the second picture)is probably a local nerve entrapment/irritation of proper digital nerve as it passes by the joint. Since you never complained of this problem before, it would be safe to assume that it is the result of the car accident. With four broken metatarsal bones I am surprised you even notice this at all. Since you are wearing a cast and the big toe is not touching the ground, you could just give it some time to see if it heals on its own, of course that means you have to stop pressing on the spot. Also, just make sure the end of the cast is not pushing into the joint when your foot is in a dependent position as it looks from the picture, it could press into the toe and aggravate the problem. If after a couple of weeks, the electrical jolt does not go away, I would suggest you ask your doctor for a cortisone shot right in the area. The cortisone should reduce the inflammation in the nerve and the pain should, hopefully, subside. As far as the ingrown nail goes (first picture), if by cutting away a portion of the nail, you sustained relief, then you can assume the pain is from an ingrown nail. However, more nail may need to be removed in order to give you complete relief. I do not believe that is something you can do to yourself and therefore it will require the attention of a doctor. Discuss both these issues with your doctor.